The resistance in Kobane continues on its 33rd day as Islamic State attacks once again intensify following coalition bombing. Islamic State militants have been attacking the city of Kobane in Rojava, Northern Syria since 15th September. An historic resistance by the different ethnic and religious groups of the city, who have organised under the banner of the Peoples’ Protection Units (YPG) and Womens’ Protection Units (YPJ) has led to unprecedented attention by the international media and international forces. In the past few days the US led coalition has begun liaising with the Kurdish forces on the ground, which has helped them carry out effective aerial attacks against IS targets for the first time. This has helped push the Islamic State back to the outskirts of the southern and eastern borders of Kobane. However the danger is not over as news arrives that the fighters of the YPG/YPJ are running low on ammunition and other military technology as IS attacks once again intensify. 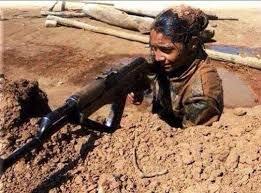 The resistance of Kobane will not be victorious until IS are completely defeated in Kobane and the surrounding region. This is only possible if a corridor through Turkey or through Iraq is opened to deliver military and humanitarian support. On 16th October the UK Parliament discussed Kobane and the IS/ISIL/ISIS threat in the region, but it was disconcerting to see that the Foreign Minister Philip Hammond was talking about the Democratic Union Party (PYD) in the way a Turkish diplomat or government figure might; saying that Turkey saw them as terrorists. This, despite the US and coalition forces officially meeting with PYD leader Saleh Moslem and conducting joint operations against IS targets. Therefore we are calling on the UK public, media and political circles to not let their guard down against IS attacks against Kobane. A false sense of victory and security is being created in some quarters. The IS scourge can only be defeated if the UK pressurise Turkey into opening a corridor to Kobane, providing military and humanitarian aid through this corridor, recognising the three autonomous regions in Northern Syria, and delisting the Kurdistan Workers’ Party from the terror list.